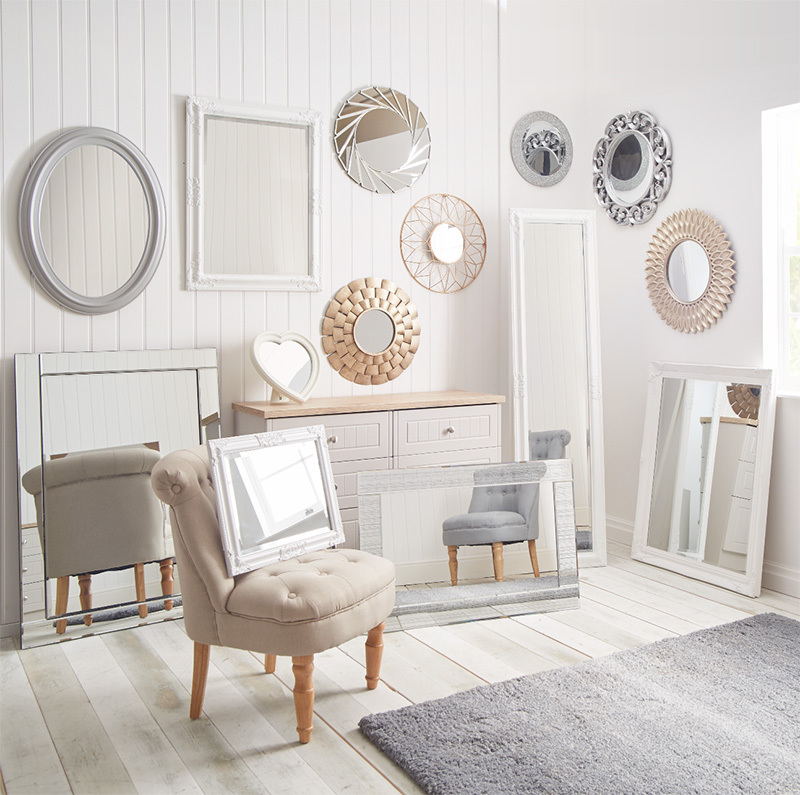 Once you’ve chosen the perfect mirror to fit your space, it’s essential that it’s hung correctly so you get the full impact and create the best possible feature in your room. With our huge range of mirrors in different shapes and sizes, you’ll have no trouble getting the look you want but the hanging of your mirror can be quite daunting. Fear not, we’re here to help! With this simple how-to guide, you’ll have that new mirror up in no time. The dining room is one of the most popular areas to hang a large mirror, as the impact can be really striking and creates the perfect atmosphere when you’ve got people round. It’s worth just bearing in mind that any light will be reflected from the mirror so it could potentially create a nasty glare instead of the natural, welcoming glow you’re going for. In a small entryway or hallway, a mirror can be a great tool to make your space appear bigger and brighter. Rooms with high ceilings benefit from long vertical mirrors to emphasise and draw attention to the space, whilst narrow, lengthy rooms benefit more from a horizontally-set mirror to utilise the space you have. Basically, work with what you’ve got! Another massively popular location for mirrors is above a fireplace. To create a professional finish, hang your mirror so that the bottom of the frame is at least four to five inches above your mantelpiece. Depending on the thickness of your frame, you may find you need to go higher to avoid a shadow being cast onto the mantel. Hold your mirror flush against the wall where you want to hang it. Check it’s not wonky with a spirit level. Use a pencil to mark where the top two corners meet the wall. Use a tape measure to find the halfway point between these two marks and pencil it on. For mirrors with one central hook: Transfer this measurement (the distance from top of frame to hanger) onto your wall by measuring down from the central point. Make a mark where you need your picture hook. For mirrors with two hooks: Place some low-tack masking tape between your two pre-attached hangers on the mirror and mark exactly where the hangers lie. Mark a point halfway between the two measurements on the tape. Measure down from your central point on the wall (with the distance from top of frame to hangers) and place the tape underneath with the two central points matching up. Make your two marks where you’ll need your picture hooks. For lightweight frames, picture hooks are the perfect tool to get the job done. Hang your mirror and check it’s perfect with a spirit level – readjust if necessary. Admire yourself (and your handiwork) in your new reflection! Top tip: This guide is perfect for lightweight frames on drywalls. For heavier frames or if you’re looking to hang onto a more difficult surface such as a masonry wall, tiles or concrete, it’s best to take advice on choosing the most appropriate drill bit, wall plugs and screws to get the job done. For small frames, make life even simpler with hanging strips, which come off cleanly and don’t require the use of any nails! Shop our full range of DIY equipment here. Shop our full range of mirrors here. Welcome to Wilko Life, our exciting blog that’s all about sharing with you the best of what we do. From the latest stories on what’s new and what’s hot, to picking out all those hidden gems that make us so unique. We’re here to help you make the most of life! Enter your details to keep up to date with our latest offers, promotions & special codes. Thank you for signing up to the Wilko.com newsletter.